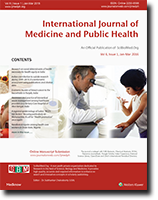 S. Sarkar, “Contribution of Healthcare-related Professional Associations to Public Health in India”, International Journal of Medicine and Public Health, vol. 8, no. 1, p. iii-iv, 2018. S. Sarkar, “Old Age and Palliative Care in Indian Scenario”, International Journal of Medicine and Public Health, vol. 8, no. 3, pp. 94-95, 2018. S. Sarkar, “Target for TB Elimination in India - Is it Achievable?”, International Journal of Medicine and Public Health, vol. 8, no. 4, pp. 131-132, 2018. S. Sarkar, “Over Reliance on Specific Disease Programmes – Are we in the Right Direction?”, International Journal of Medicine and Public Health, vol. 7, no. 4, pp. 181-182, 2017. S. Sarkar, “Palliative Care for Non-Cancer Patients in Tertiary Care Hospitals”, International Journal of Medicine and Public Health, vol. 6, no. 4, pp. 151-153, 2016. S. Sarkar, “Providing Services for Elderly in Rural India – Is Anganwadi Centres a feasible option?”, International Journal of Medicine and Public Health, vol. 6, no. 2, pp. 57-58, 2016. S. Sarkar, “Research on social determinants of health necessary for health equity in India”, International Journal of Medicine and Public Health, vol. 6, no. 1, pp. 01-03, 2016.